Excellent price and next day delivery. Will return to shop again. Better too many ports than not enough! Super useful for adding new devices direct to network for fast transferring. 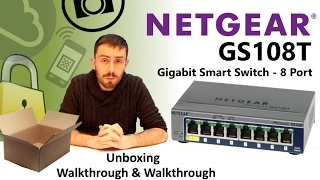 Neetgear make very reliable products and this is one too. Reasonably price, fast turn around on the 8 LAN switch port. Ordered one day, received the next. Our 6 port switch has broken and we would not have been able to hold out much longer than that! The extra two ports gives us a little more wriggle room for machinery. Thinking of expanding the home network and wanting really good performance. This seems to have a lot of control options which Im liking. I can prioritise certain devices - ie home office over media when there is a lot of use going on. 8 LAN ports means lots of device options.